A Florida-based author has released her debut fantasy novel about the whirlwind romance and subsequent adventures of a charming sailor and a beautiful mermaid. 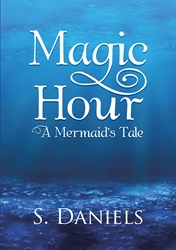 In “Magic Hour,” S. Daniels presents a fast-paced love story that will take readers on an aquatic journey through the mysteries, wonders and dangers of the sea. Set off the shore of Costa Rica, Daniels’ book chronicles the fantastical tale of David McAllister, a skilled seaman, and Gem, a curious mermaid. When the pair crosses paths in the dark ocean waters, they are bonded by their instantaneous attraction to one another, marking the start of a magical expedition that will take them to uncharted destinations. Overflowing with colorful descriptions, “Magic Hour” presents a transcendent escapade into the briny deep. As Gem and David embark on their thrilling journey, readers will find themselves swept up by the couple’s captivating romance and riveted as the duo faces down the perilous threat of an ancient witch’s curse. S. Daniels has been an artist and creative person for as long as she can remember and originally wrote “Magic Hour” as a gift for her husband and children. Daniels majored in art in college and created short stories and illustrations often in her youth. She currently resides in Ocala, Fla.